With around a half century behind the video game medium at this point, it’s clear that it is taking after other forms of entertainment media in at least one point: no idea that was ever bankable will stay dead forever. Genres wax and wane, creators leave their beloved IPs and return, companies collapse and get bought up by the next ambitious up-and-comer, and franchises thought to be rendered toxic by a low quality installment or five can spring back to life with incredible force. You can’t stop this train we’re on, even if you wanted to. Like many other genres, point-and-click adventures were declared dead a long while back, a condition which never really stopped them from going about their (substantially reduced) business anyway. It’s not that they ceased to be released altogether, but it’s certainly arguable that changes had to be made to accommodate survival. If you liked them just fine the way they were? Well, you were out of luck. When Western gamers talk about “the way they were", they usually mean the adventure games that came from LucasArts during the late 1980s and early 1990s. Maniac Mansion, Monkey Island, Day of the Tentacle, Sam & Max Hit the Road, Loom, and so on. If you weren’t there at the time, you may not realize that these were the games that opened the genre up to a lot of people. Accessible, funny, and clever in both writing and design, LucasArts adventures completely reinvented the general wisdom about what an adventure game ought to be. That’s what people are usually crying out for, and to the extent that any decent scratch is to be made in point-and-click adventures in the North American market, it must be made in service to that. Telltale Games hit the big time with The Walking Dead, but they never would have survived long enough to make that if they hadn’t gotten rolling with new adventures based on Sam & Max and Monkey Island. Doublefine games broke Kickstarter records by promising a new adventure game from some of the people that worked on the LucasArts hits. 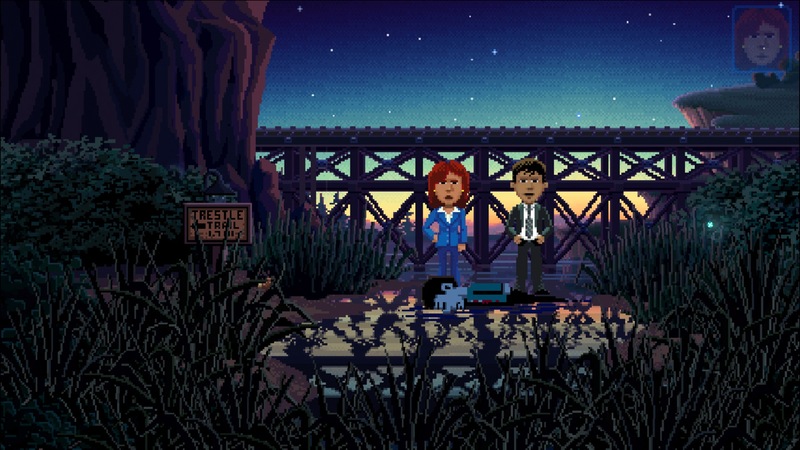 At first blush, Thimbleweed Park ($9.99) seems like another one of those affairs. It features some of the big names from the salad days at LucasArts like Ron Gilbert, Gary Winnick, and David Fox among others. It ran a successful Kickstarter campaign that hit all of the necessary buttons. 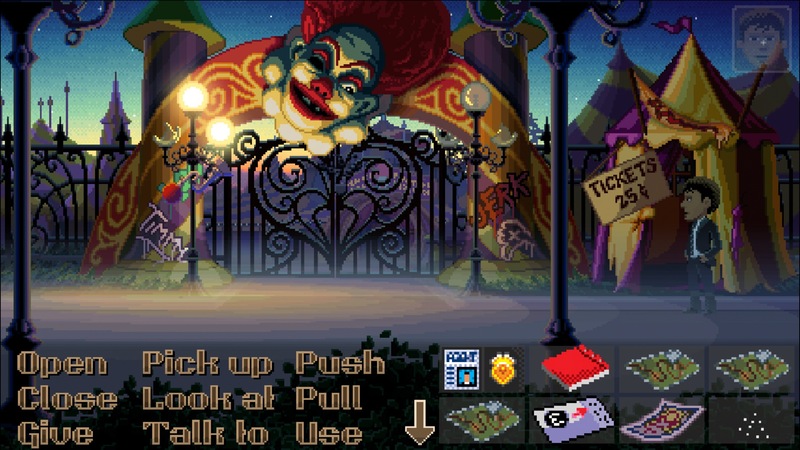 The game’s art style evokes Maniac Mansion with its large, expressive faces and jam-packed backgrounds. The pitch for the game actually described it as being “like opening a dusty old desk drawer and finding an undiscovered LucasArts adventure game you’ve never played before". So you’re probably expecting the Tales of Monkey Island/Broken Age special here: lots of references to pop culture and the older games, some funny jokes, a heartfelt scene or two to try to pluck the heartstrings, a few fourth-wall breaks to wink at the player, and simplified puzzles that don’t get in the way of smooth progress through the story. You will get that in Thimbleweed Park, at least for a while. You’ve got a wacky premise that riffs off of Twin Peaks and X-Files, with two agents independently arriving in a weird little town to solve a bizarre murder. It’s not hard at all to find one of the game’s many references to Guybrush Threepwood and his adventures. It takes all of five minutes for the game to shatter the fourth wall. But it feels a lot like Maniac Mansion, and such things are pretty rare these days, so you keep on playing. After all, LucasArts alumni doing the expected is still better than a lot of what’s out there. The game includes two difficulty modes, and while that’s usually little more than an afterthought, you get two very different Thimbleweed Park experiences out of them. The Casual setting really does mean it. Many of the more complex puzzles get cut entirely. Almost every surviving puzzle is dramatically simplified to completely remove any potential friction. Basically, it’s about on the level of the puzzle-solving in many of Telltale’s post-Walking Dead releases. The missing pieces are quite noticeable at times, as you’ll run into many items without a use and situations without resolutions, to say nothing of some conspicuously-placed key items. You get the same story in broad strokes, but the puzzle emphasis is cut down so significantly that it becomes more of a narrative experience than anything else. If that’s what you’re looking for, it’s nice to have the option. Thimbleweed Park on Hard mode is probably the closest thing I’ve seen to a classic LucasArts-style adventure in a very long time. It mixes some downright diabolical yet usually fair puzzles with off-the-wall humor, an odd twinge of horror, and an intriguing setting. There is some relief in the form of an in-game hint line you can call and some handy to-do checklists, but you’re going to have to put on your adventure game-face to suss out the answer to a few of the late-game puzzles. The game likes to throw in red herring items and multi-step solutions are essentially the norm. Pick up everything, but don’t expect to use it all. The art style and SCUMM-like interface help hammer home that nostalgic feeling even more. But the thing is, Thimbleweed Park isn’t what it appears to be. Not completely, anyway. As much as it trades on its nostalgia in a very authentic way, I reject the notion that you would have found this in that dusty LucasArts drawer. This game’s riffs and call-backs have a purpose that goes beyond trying to reminisce about the good old days. I can’t fully explain this without spoiling too much of the story, but this game has a lot of things to say about nostalgia, adventure games, and pop culture entertainment in general. In a lot of ways, it comes off like an incredibly personal story from its developers. It’s coming from a very different place than those 1990s LucasArts adventures. An older place. Perhaps a wiser place. A scarred place in some ways, but so long after the fact that we can take solace in the wounds not being fatal. This is a weird game that in its entirety isn’t going to work for everyone. I’d go so far as to say that the more you like certain bits of it, the less you’ll like others. That’s a really unusual quality in a video game. I can’t even really separate its mechanics and its story, because they are tightly woven together down to the very last puzzle. If you loved the gameplay of Maniac Mansion in particular, you’ll probably really enjoy how Thimbleweed Park‘s multi-character puzzles are put together. You have access to every character rather than having to pick a team, so there isn’t quite as much replay value, but the basic outline fits. Some of the puzzles feel quite mean-spirited in the moment, but once you’ve worked them out you’ll probably be kicking yourself. That’s about the right feel for a game like this, I’d say. This iOS version of the game is quite nice. Point-and-click games aren’t a new thing for this platform. They tend to take well to touch interfaces, and the same can be said here. I found choosing dialogue to be a little fussy sometimes on the smaller iPhone screen, but that may well just be my sausage fingers acting up again. There are plenty of options, even down to which way the toilet paper sits on the roll in the game’s many bathrooms. I didn’t encounter any bugs or glitches in my two playthroughs of the game, so it seems solid enough in that respect, too. It’s a good port, and I’ve always felt adventure games make for a good fit for mobile devices. The game makes frequent auto-saves and you can manually save at any time in one of several files, so it’s even decent for on-the-go play. I’m not sure how well my enthusiasm is coming across in my words. I’m still sort of processing the game’s story as I write this. I suppose the important thing to say is that I couldn’t put Thimbleweed Park down until I finished the whole thing, and while I have some issues with pieces of its narrative and a puzzle or two, I’d still highly recommend the game. Thanks to its difficulty options, I don’t even have to add a qualifier on there, but you’ll get the most from the game if you have some adventure game experience already. 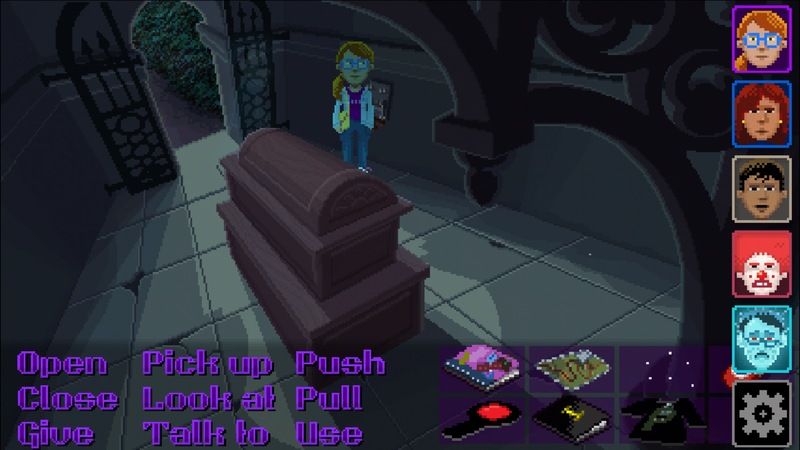 Thimbleweed Park isn’t exactly a 1990s LucasArts game in 2017, but it is what a 2017 game would look like from the people that made those games, and I think that’s a lot more interesting than just diving for happy memories.